Gorgeous designer and special sarees to wear at Karva Chauth! At Karwa chauth, you don’t have to lose it all thinking what to wear for the evening moon gazing ritual. We Indian women can be a choosy bunch, and that is why we would rather meticulously plan our trousseau, than to just wear what comes around or is given to us. For Karva Chauth, the same would apply, and to make an impression on hubby dearest, we are here to help you doll up like a gorgeous queen. Take a look at these gorgeous twenty designer and very unique sarees to wear at the rituals being performed that evening. Hip, classy and very elegant too, you cannot but want them all! 1. 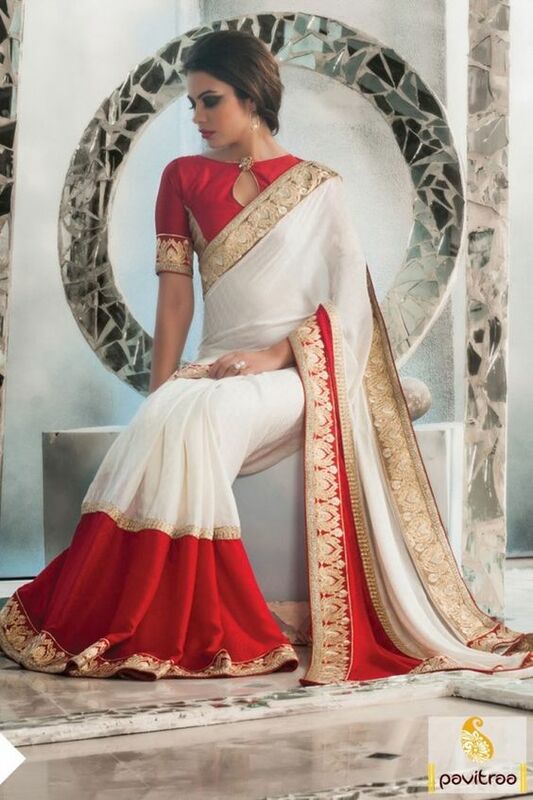 White red silk creape jacquard designer saree: The white red silk creape jacquard designer saree is a classy touch to your wardrobe, which can be worn at the Karva Chauth rituals too. The gorgeous designer saree is a one-of-a-kind princess-ish ensemble that can be accessories with a Kamarbandh and a statement neck piece, heels for the feet and a gorgeous pair of chunky Chaand-balis for the ears to complete the look. 2. Peachy touches on a designer saree: If peach is the color you love and would want to wear for the evening, then peach it should be. Balance the warm toned peach with a blouse in cool greens- full-sleeved and with embellished embroidery touches on it as well. The perfect updo would be a vintage weave of the bouffant and with gorgeous cat eye smokey makeup to complete the look. A statement neck-piece for sure would be icing on the cake with dangling earrings. 3. 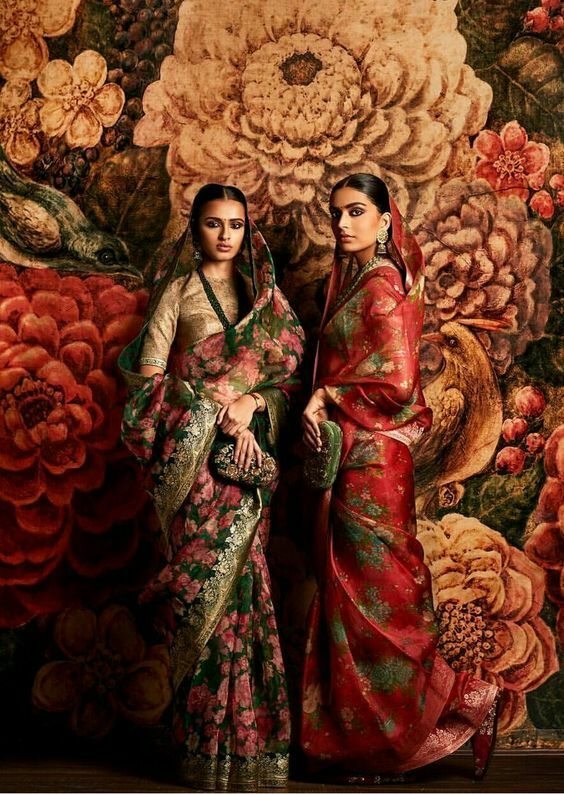 It has to be Sabyasachi: When mentioning ‘designer sarees’ can we forget to mention Sabyasachi? It would be a sin to do so, which is why we bring to you a gorgeous appliquéd work netted and lace saree by the ace designer. Paired with a metallic cropped blouse which is sleeveless, the elegant look comes by with a low sleek bun and a string of pearls for the neck- makeup is minimal and so is the accesorization too. 4. The Sanjay Leela Bhansali vibe: A touch of Bollywood is what we would want to see with our ladies this Karva Chauth, which is why the Sanjay Leela Bhansali vibe in georgette and simmer gorgeous printed sarees could be the in-thing for the Karva Chauth ritual. Paired with dangling jhumkas and minimal makeup, long statement neck-pieces and a hint of dark eyes, the desi-ness comes out to the forefront for sure. 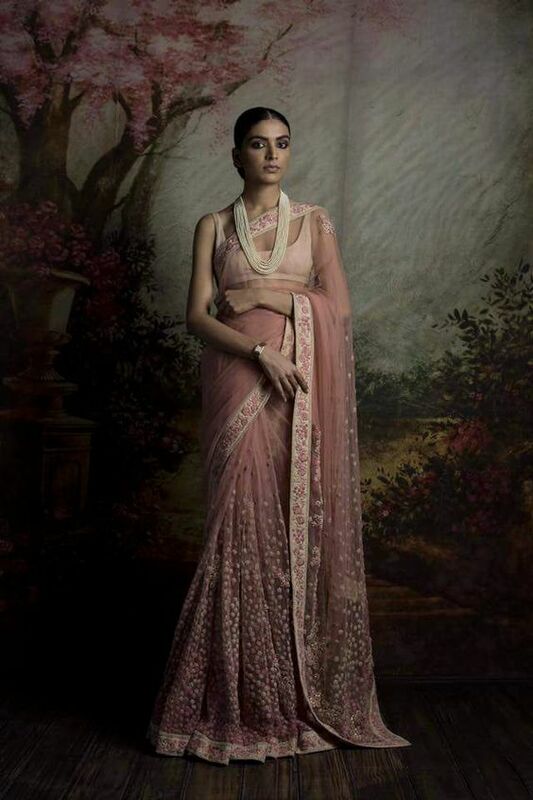 Once again, courtesy designer Sabyasachi! 5. 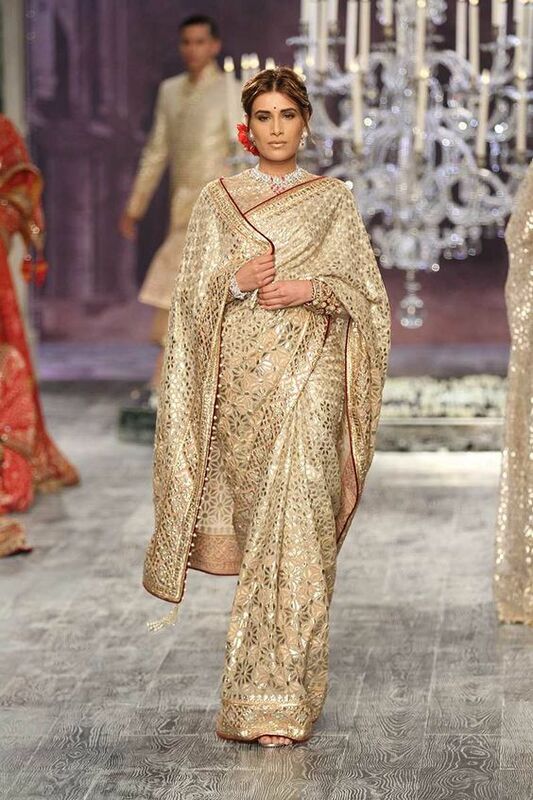 An elegant touch of off-white and cream: Metallic hues on off-whites and creams can work wonders, especially when ace maestro designer Tarun Tahilliani is at work. The look of this saree comes as elegant and graceful, with a very vintage touch for sure, making it perfect for the Karva Chauth wear. Complete the look with matte toned red lips and a sleek updo, a high collar full sleeved blouse in all its glory with dangling ear pieces to wear. We have more options so gorgeous in sarees to wear, which are here below that we would want to share; check them out! Doll up for the evening and impress hubby dearest, because tonight’s the night when you show him your gorgeous touch!